Chicago scientist Thomas Rosenbaum demonstrates entanglement, a phenomenon that leaves classical physics out in the cold. Physicist Thomas Rosenbaum has long sensed something strange about a salt called lithium holmium yttrium tetrafluoride (lithium holmium fluoride for short). His lab has been experimenting with the rose-hued crystals for 15 years, and no matter how low the researchers drop the temperature—even to within a few thousandths of a degree of absolute zero, or –459°F, theoretically the temperature at which all molecular motion ceases—the salt won’t freeze. “That’s a very peculiar behavior. There must be some hidden variable to explain it,” says Rosenbaum, the John T. Wilson distinguished service professor in physics, the James Franck Institute, and the College—and also the University’s vice president for research and for Argonne National Laboratory. Now his team has finally solved the mystery: the material’s atoms are “entangled,” he and Sayantani Ghosh, SM’01, PhD’03, reported in the September 2003 Nature. 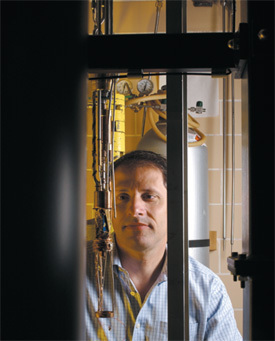 Thomas Rosenbaum checks a freezer that cools samples to not-quite absolute zero. When particles are quantum mechanically entangled, they have a bond that supercedes how each would act on its own. According to the rules of classical Newtonian physics, as the temperature approaches absolute zero, no matter what the material, individual particles and atoms freeze. Rosenbaum and Ghosh demonstrated that entanglement can break this rule. The atoms in their salt are connected by electrons whose spins—or magnetic orientations—are entangled in pairs. Those magnetic pairs obey a higher power—their innate bond with one another—rather than classical physics rules, and so they don’t freeze. Ghosh and Rosenbaum’s experiment was, in comparison, relatively simple. Although the researchers knew that lithium holmium fluoride wouldn’t freeze, they didn’t realize why until they played with another of the compound’s quirks: its magnetic susceptibility. The spins of the salt’s holmium atoms move freely, flipping around like compass needles. At very low temperatures the spins “calm down,” Rosenbaum explains, and become susceptible to the pull of an outside magnetic field. Rosenbaum and Ghosh sent a charge through a wire looped around the salt crystal, and the holmium atoms aligned with the outside force. “They sense that there’s a magnetic field out there, and they want to follow it,” Rosenbaum says. The researchers used this quirk to learn more about the salt’s spins. When left undisturbed, the spins have the bizarre quantum ability to occupy two states at once, to point both up and down at the same time, an occurrence called superposition. The discovery is a milestone in the quest for a quantum computer, a tiny device capable of making lightning-fast computations. The fumbling hands and clunky manufacturing capabilities of humans can construct something only so small before the very process of building the thing messes it up. Nanoscientists are encouraged by Rosenbaum’s finding because they study materials that form patterns on their own and try to harness that self-assembly. The spins in the lithium holmium fluoride self-assemble into interconnected peaks and valleys that resemble sand dunes—or perhaps the wires on a computer chip. This particular material won’t likely be used as a quantum computer because its entanglement is too sensitive to temperatures. Even heating the salt to one degree above absolute zero causes its spins to “become too excited to care what their neighbors are doing.” The question thus becomes, Rosenbaum says, “Is this material so peculiar that it’s the only place we see entanglement, or is the phenomenon more universal?” He, of course, suspects the latter.—S.A.S.